Have you been playing the lottery for years (or any amount of time for that matter) and never seem to even come close winning? Are you picking numbers that you believe are destined to win, like a birthday or your favorite number only to wind up never winning a red cent? Do you believe that if you keep picking the same number over and over again, it will eventually have to come out because the law of odds says so? If you’ve answered yes to any one of these questions, then I’m glad you found your way to this website. So if you’re as serious about increasing your odds of winning as I am about helping you, do so, then shut your cell phone off for a few minutes and listen closely to what I’m going to share with you. Before we begin, I bet you’re wondering……. who the heck I am and why you should listen to me? My name is Steve G. Jones and for the past 25 years of my life, I have been helping improve the lives of others using the power of hypnosis. I currently have the largest set of hypnosis recordings in the world and have worked with people from all over the world ranging from humble homemakers to high profile celebrities. “And just what does that have to do with the lottery?” you ask? Well, as you can imagine, one of the biggest areas that people are either struggling with or want to take to the next level has to do with finances. I mean let’s face it, money may not be everything, but it sure does help. And the more you have, the more opportunities are available to you. With that in mind, I decided that part of my mission would include investing my time and energy in creating various resources that could all be utilized to help people build wealth, achieve financial freedom or simply just have more money. And when it comes to having more money, there are only 2 legitimate ways this can happen; you can either earn it or someone can give it to you. And in many cases, those 2 events coincide with one another. In other words, even when you earn money, someone else is still giving it you. Whether it is for a product or service that you provide or a return on an investment, this money still comes from another party. Winning the lottery is no different. If you purchase a ticket and that ticket turns out to be a winner, then you earned it. Now, many people consider that winning rather than earning because it takes little effort and the chances for success are slim. Therefore, they assume that because one cannot actually contribute to the result, that the result occurs because of luck rather than effort or strategy. Well, what if there was a strategy that could be applied to increase the chances and make the result more predicable? And what if that strategy was based on mathematical principles rather than opinion? Well, I’m here to tell you that I not only have developed that strategy but I’ve also taken my background in metaphysics and further enhanced my formula by giving you the tools you will need to deal with winning once you have done so. 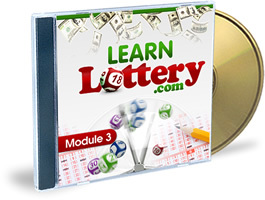 Introducing Learn Lottery by Steve G. Jones, M.Ed. Gambling Like You’ve Never Seen It – Here I’ll expose you to real facts that highlight the positive aspects of gambling and the lottery. Introduction To Patterns - Discover the importance of lottery patterns and what secrets make even the most unpredictable games; predicable. The Power Of Positional-Analysis – Discover the single technique that will forever change the way you look at the lottery or any game involving numbers. Pattern Mastery - Learn the techniques championed by the masters that will equip you with the power to predict and analyze patterns. Lottery Basics - Learn about straight-bets and boxes and how they will impact the strategy best suited for you. Valued Strategies - Learn about the Austrian mathematician Dimitrov and why what he has to say is essential to this formula. Winning Myths Debunked – Here I’ll expose all of the common (and not so common) misconceptions about certain strategies that have been marketed to ensure success but have no benefit whatsoever. Rules Of Engagement– You can’t truly play the game without knowing how it works. Here I’ll reveal everything you need to know about lottery policy. The Power Of Positive Thinking - Learn how positive thinking can position you for success and how to apply it in the most effective way possible. Attracting The Win – Here we’ll dive into the subconscious mind using the same techniques that one couple used to win the lottery…..TWICE! Visualizing A Healthy Future- Discover the power of visualization And how it will set you up for success after winning. Initial Winning Steps – Here I’ll share the essential tips and advice on what you should do within minutes, weeks, and months of winning so you don’t lose it all like many others in the past. Long Term Actions – More people than you can imagine have wound up broke within just 2 years of wining the lottery. Follow the steps outlined here and you won’t become another statistic. Making Your Money Work For You – Here I’ll show you exactly what to include in your financial plan so your money keeps multiplying. You also learn about the type of people you should consult for advice on managing and growing your finances. Financial Balance – Wealth is great but health is essential. Here you’ll learn how to align your thoughts and emotions with winning so you can achieve true balance. 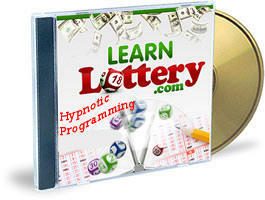 Lottery Hypnosis – Here I’ll take the craft that I’ve mastered and show you how to prepare and win the lottery. Using the power of hypnosis you win the lottery and prepare for it. Clearing Your Limiting Beliefs – Here you’ll learn how to re-program your subconscious mind to break down barriers that lead you to believe that winning isn’t actually possible. What you have in front of you is the unique opportunity to own a resource that will equip you with everything you need to do just that and more. For just $27.97, which is less than what most people spend on lottery tickets in one week, you can increase your chances of never having to buy a lottery ticket again. And guess what; I’ll even give you the opportunity to see how “real” this program is without risking a thing. So let me ask you, are you ready? Are you ready to start changing your life and move in the direction that you’ve always wanted? Are you ready to position yourself to never have to worry about money again? Are you ready to stop wasting time dreaming about what could be and instead creating your new reality? If so, then take action today by owning this empowering resource today! You understand that this program is not guaranteed to make you win the lottery but instead designed to help you mathematically & statistically increase your chances of winning the lottery. Click Below To Order For Just $37.97! (Digital Download Version and on CD. An additional $5.00 will also be charged for s/h. P.S. – Remember, your chances of winning the lottery are not as slim as you think. Your chances of losing it all however, are probably higher than you think. This system will equip you for success in both areas. P.P.S. 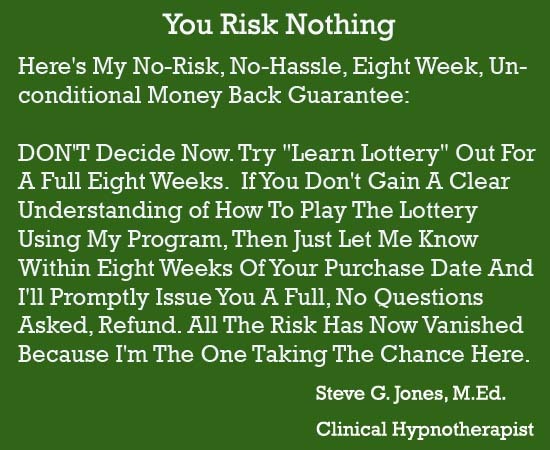 – You have nothing to lose except the opportunity to increase your chances of winning because if you’re not 1000 percent satisfied, I’ll buy the program back from you.